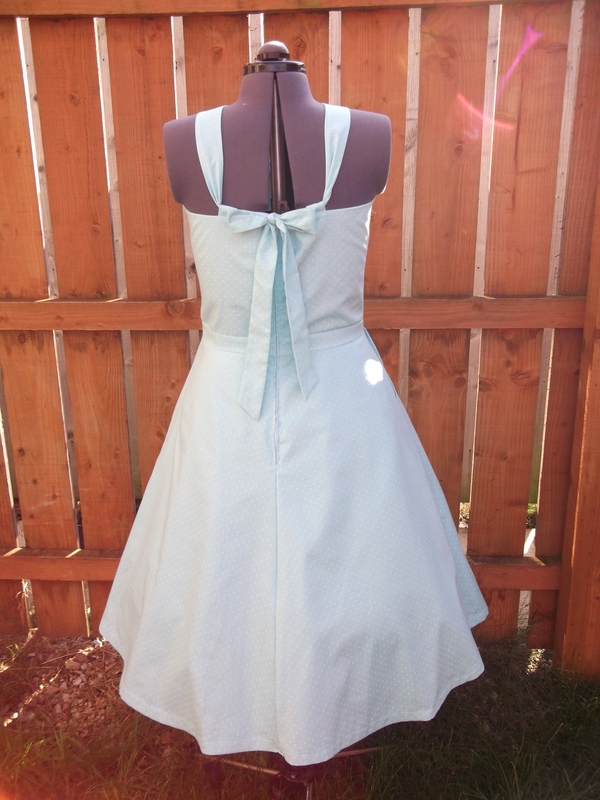 As soon as I found out about the new Sewaholic dress pattern I was excited, as dresses are my favourite garments. 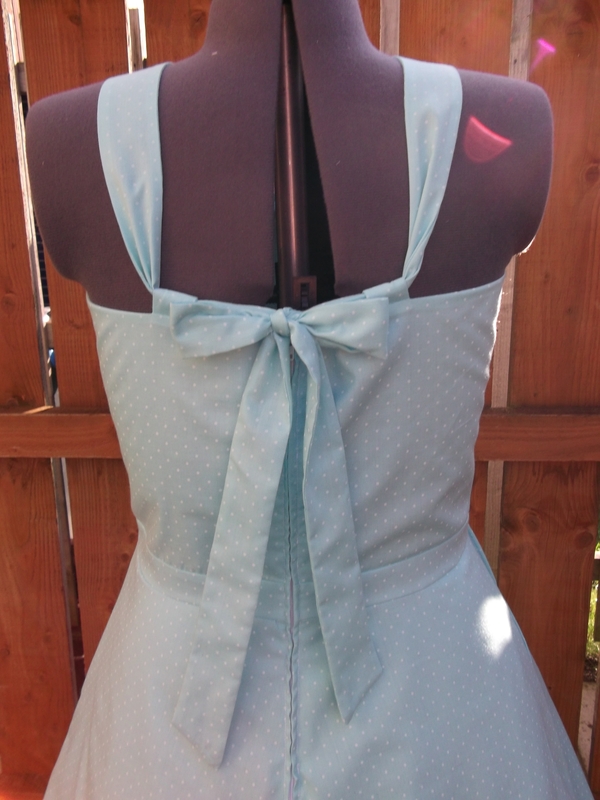 I love the design of the dress – the way it looks like a halter neck but ties in a pretty bow at the back (just how pretty depends on who’s tying the bow…). 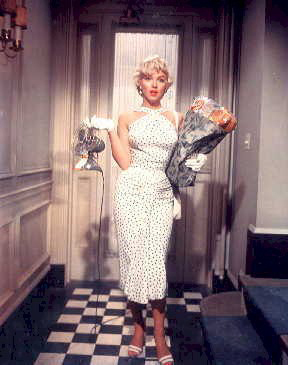 I wonder if Tasia (the Sewaholic designer) was inspired by this Marilyn Monroe dress? 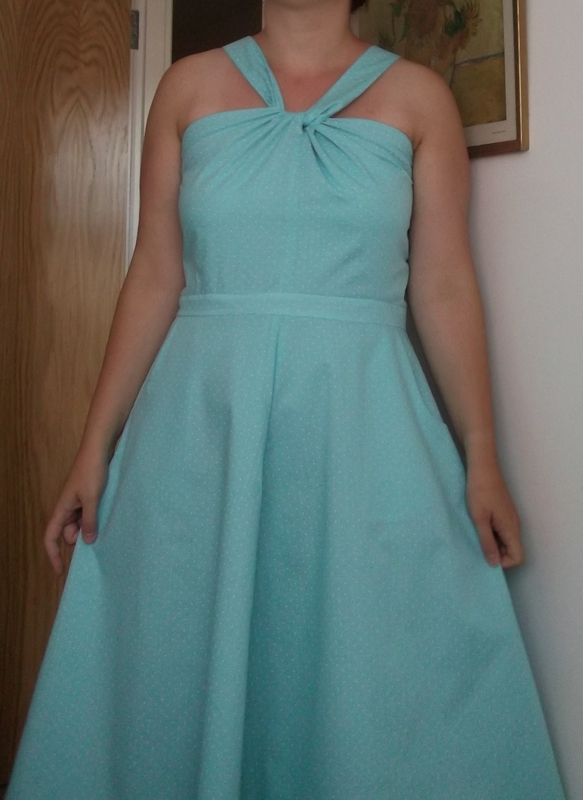 As I’m going to a wedding in September I thought I’d like to use a more luxurious fabric than I normally would to make this dress special enough to wear to the occasion. I went to the fabric shop and bought navy crepe back satin, but then decided it would be better to make a different version of the dress first in order to test the fit and see how much I liked it. 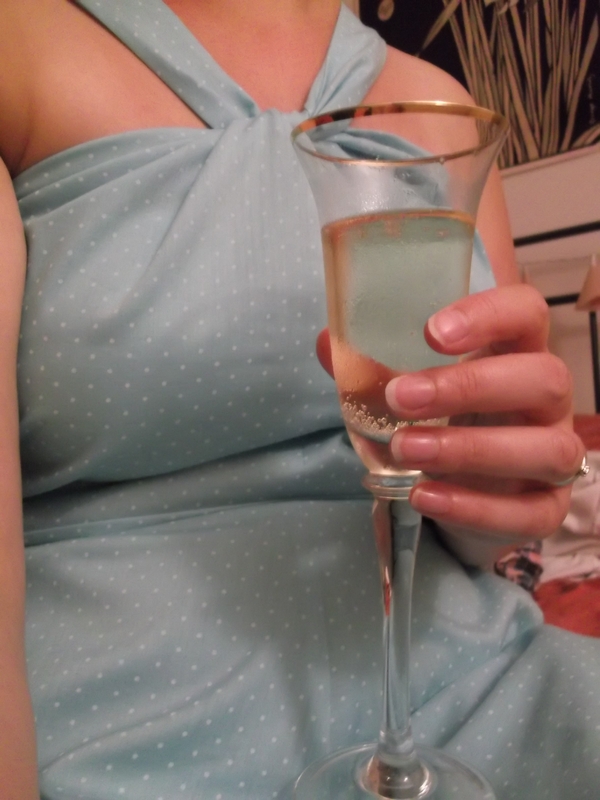 I didn’t want to cut into the silk without being sure, so I found some lovely aqua cotton lawn with tiny white polka dots at a very reasonable price and bought that to use for my first Lonsdale. Tasia was running a Sewalong on her blog so I got a few tips from her to get me started. Normally I run tragically late with these Sewalongs (my Colette Negroni shirt for Mr Tweedie was completed six weeks after the Male Pattern Boldness sewalong had concluded! ), but the fact that I’m attending another wedding this weekend spurred me on – I was thinking I might wear my first version to the wedding tomorrow! My fabric was very light and fairly sheer. The double layered bodice would preserve my modesty at the top but I had to line the skirt as well. I decided to line it in the same fabric. I used French seams for the skirt lining and the main skirt because the fabric is so light (and also because my serger is currently threaded with black thread for another project I’m working on). When it came to hemming the dress I made a silly mistake – I accidentally hemmed the outside of the dress as if it were the lining, at 1.5”! Luckily it was a neat hem – it just meant I had to trim the actual lining by an inch and then hem that with a 1” allowance to make it 1/2” shorter than the outer skirt. In terms of the length of the dress, I wasn’t bothered about it being a little shorter as the dress is pretty long anyway. Then came the biggest challenge – getting Mr Tweedie to fasten it all up for me! Poor Mr Tweedie – I kept on getting him to tie and re-tie the bow to get it just right for a photo! This was Mr Tweedie's attempt at tying the bow! This is how the bow should ideally look! The verdict? The dress is a little too big, though still wearable. I did a tissue fit of the waistband before starting and thought it would be ok, but I definitely need a smaller size. 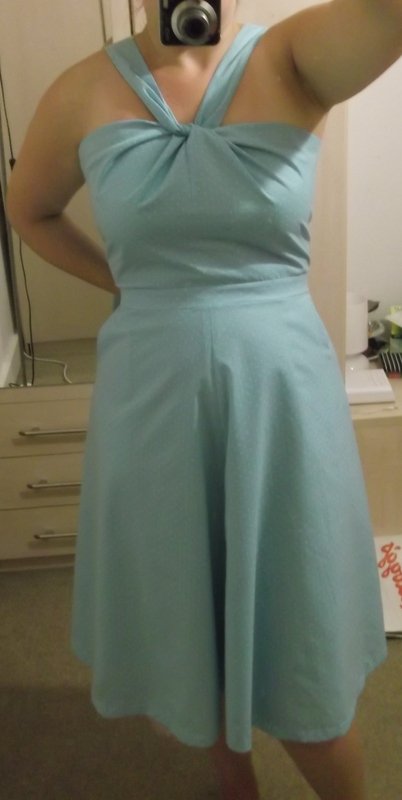 Below is a photo of the dress as is, and another of me pulling the excess fabric in at the back. I’m glad I didn’t use the silk for my first Lonsdale – I’ll be retracing the pattern in a smaller size for my second version! Me wearing the dress. It's a bit loose at the waist. I think it looks better more fitted! Oh, I seriously need this pattern now- yours is too lovely!! That came out so pretty with the light blue. What a great going to a summer wedding pattern! What a lovely job you did with this dress ! Wowsers !! 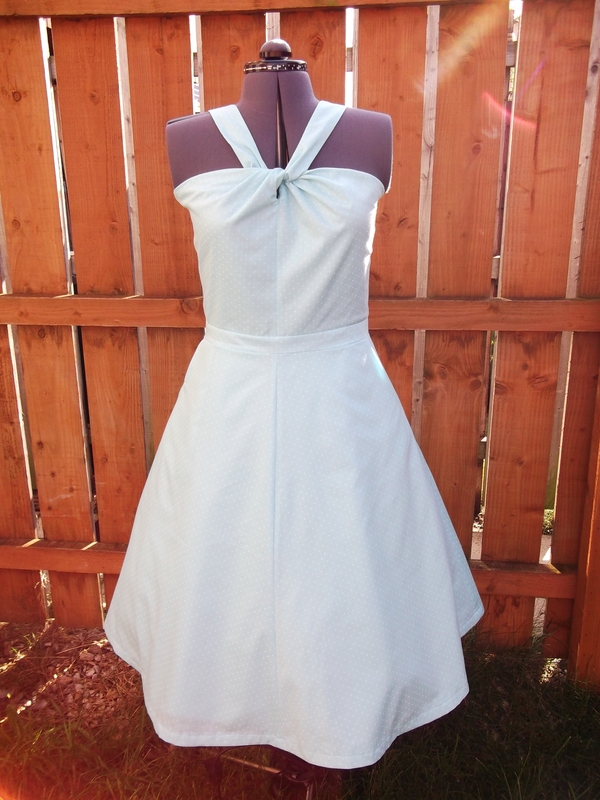 Found your dress googling for images of finished Lonsdales– yours is super cute! Great job! It doesn’t look bad at all a little looser, just looks like a nice relaxed summer dress! I think it looks beautiful on you. I am just about through wtih mine and I had to do some major fitting adjustments in the bodice. I want this pattern.The dress is beautiful. And it looks great on you. Send us a link to your photos if you make the dress!